Not too many people saw the 2009 movie Surrogates in which Bruce Willis plays both his old, gnarly self as well as a plastic, youthful-looking robot version of himself. Image still from Surrogates trailer. Click image to go to video on YouTube. In the still above, Bruce Willis is sitting in a recliner, wearing a comfy bathrobe, about to lie back and put on what looks like a late-model version of the Oculus Rift. He’s looking at his own personal surrogate robot. In the movie, these robot surrogates not only allow people to look younger than they actually do, but also do risky stuff without any possibility of getting hurt. Now, when I watched the movie, my main gripe throughout the whole thing was that if all you’re using surrogates for is to sit around an office with other surrogates, then you might as well skip the expensive robot and just do everything on the cheap, in virtual reality. But I can see places where this kind of robot might make perfect sense. In space walks, say. Or defusing bombs. Or underwater repairs of oil rigs. Or rescuing people from burning buildings. Student controls the robot by moving his own fingers, arms and head, and sees everything the robot sees via the Oculus Rift. Well, that day might come sooner than I thought. 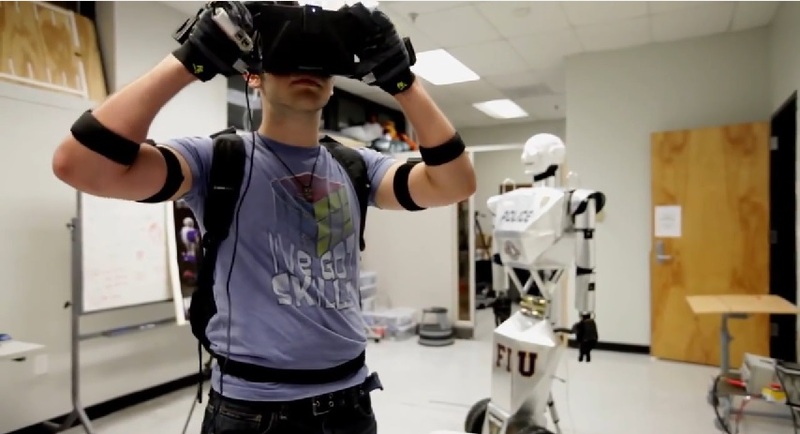 A group of students at Florida International University has combined an Oculus Rift, motion sensors, and a prototype law enforcement robot to create TeleBot, a six-foot tall, 75 pound machine that can currently move its head and arms and roll around. It’s a long way away from RoboCop, and the goal here isn’t so much to allow humans to do dangerous work remotely but to help disabled officers. But it’s an interesting start, and an innovative use of the Oculus Rift. The video below is well worth watching in its entirety.